Ivy vines are woody plants that offer a classic elegance to gardens, buildings and other landscape areas. You can choose from various types of ivy vines. Some ivy varieties tolerate fully sunny, urban conditions, while others prefer shady lighting in more wooded areas. Select ivy vines for your landscape according to the vine's lighting requirements, full-grown size, flowering times and winter hardiness. The grape ivy vine (Cissus alata) naturally occurs in the tropical parts of South and Central America and typically winters well in USDA zones 10 to 12. This climbing vine prefers consistently moist, well-drained soils. Grape ivy tolerates various lighting conditions, but prefers partial shade. Mature plants range from 6 to 10 feet in height with spreads ranging from 3 to 6 feet. This vine features stems with red hairs and dark green, shiny leaves. Non-showy, green flowers sometimes appear in the summer and give way to dark berries. Spider mites, mildew and white flies occasionally occur. Use grape ivy vines to climb trellises or plant them in hanging baskets and containers. The English ivy plant (Hedera helix) quickly and aggressively spreads up to 100 feet in length and 50 feet in width. English ivy vines feature greenish-white flowers in September and October. This European native was brought to the United States by settlers and generally winters well in USDA hardiness zones 4 to 9. Vines prefer rich, loamy soils in partially to fully shady locations, but can also tolerate full sun, various soils and some drought conditions. Scale, mites, aphids and mealy bugs sometimes appear. Use English ivy as a trailing ground cover or plant it to climb walls, fences and trellises. Boston ivy (Parthenocissus tricuspidata) is native to Asia and can handle winter temperatures in USDA zones 4 to 8. This vine features shiny, deep green leaves that turn deep red to purple tones in the autumn. The non-showy, greenish-white flowers appear in June and July, followed by dark blue to black berries that birds eat in the autumn. Mature vines range from 30 to 50 feet in length with spreads up to 10 feet. Boston ivy prefers dry to medium-moist soils with good drainage. Although this ivy variety can tolerate fully shady locations, the best autumn coloring occurs in full sun. Plants tolerate various soil conditions as well as urban pollution. Watch out for wilt, scale, mildews and leaf hoppers. 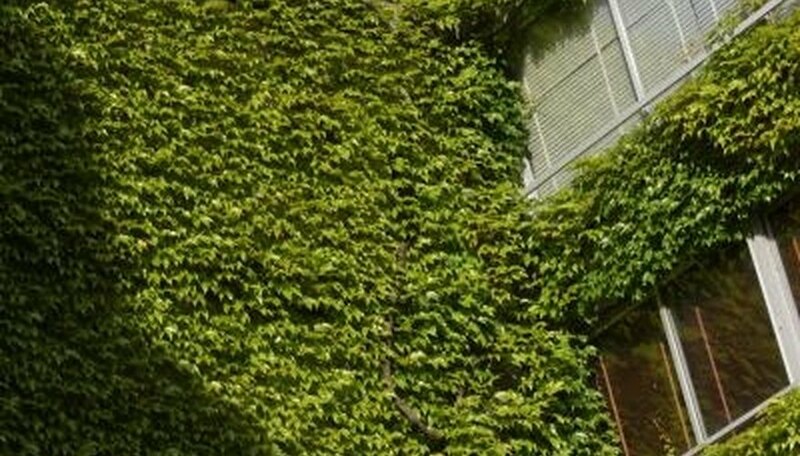 Use Boston ivy to climb stone or brick walls, arbors or large trellises. Bullock's heart ivy (Hedera colchica) features leathery leaves that are marbled with gray-greens and deep greens and have cream to yellow leaf margins. The large leaves are shaped like hearts. Winter hardy in USDA zones 6 to 9, this flowering vine reaches up to 40 feet in length and 6 feet in width. Plants prefer well-drained soils in partly to fully shady locations. Greenish-white flowers appear in September and October. Snails and slugs sometimes breed in the foliage. Use this versatile vine as a ground cover, erosion control plant, a climbing vine or a houseplant. University of Florida IFAS Extension; English Ivies to Know and Grow; R.W. Henley, et al.